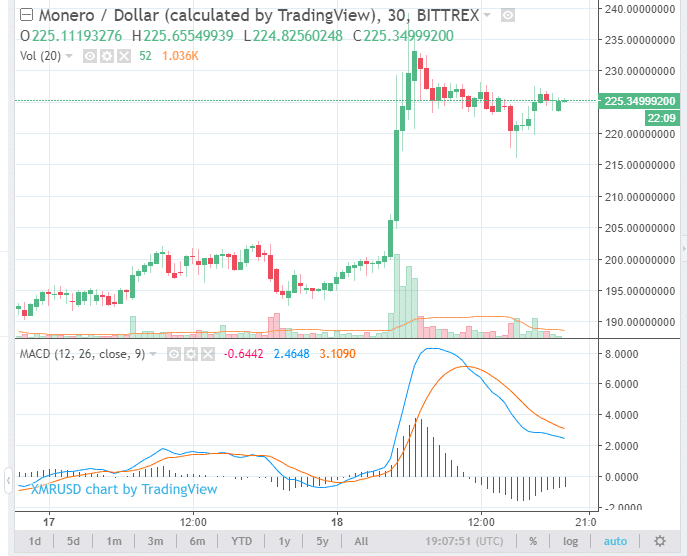 Monero, the 11th largest cryptocurrency with a market capitalization of nearly $3.6 billion, jumped more than 12 in the last 24 hours as its price rose to $233.74. Monero, a privacy-centric currency, trails 10th place IOTA, which has a market cap of more than $4 billion. Monero has gained $1 billion this week, having begun the week at $167.78 with a market capitalization of $2.66 billion. The cryptocurrency has almost recovered the capitalization it gave up over the past month; the price reached $233.53 on March 21 with a market cap of $3.732 billion. It still has a way to go, however, to reclaim the $389.03 price on Jan. 20, when its market cap topped $6.078 billion. The price remains well above the $40 to $50 range it was in last year. Monero was among a host of cryptocurrencies, including bitcoin, that allowed the market to climb to $334 billion, eyeing a move to $350 billion. Bitcoin rebounded to $8,100 over the past 24 hours after it dropped to $7,850 on April 17. Monero activated its semi-annual hard fork on April 6, bringing a host of new upgrades. One particular Monero upgrade, though, threatens to split the network into two competing chains. Monero earlier this year announced its intention to update its instance of the Cryptonight Proof-of-Work (PoW) mining algorithm at regular intervals to prevent mining hardware manufacturers from developing Monero-compatible Application Specific Integrated Circuit (ASIC) miners, as critics allege that these devices lead to mining centralization and threaten the network’s health. ASIC chips maximize efficiency to such an extent that it becomes no longer profitable to mine with GPU miners, whose chips are general-purpose and use for everything from PC gaming to searching for extraterrestrial life.